This norwegian expression used to drive me absolutely crazy. ”There is no bad weather, only bad clothes,” is the rough translation. I beg to differ. There are some weather situations where not even all the wool-lined gore-tex on the planet will keep you warm and safe. That being said, however, I’m getting closer to getting what the composers of this slogan-now-turned-way-of-life (or was it the other way around?) intended; if you wait around for the non-rainy, non-snowy, non-muddy weather to show up…well, June is a long way off. Being ”out” is the norm here; and ”out” means, like, outside, not out at the bar on a Saturday night. The amount of clothes the kids need at barnehage in order to be prepared to be outside in any type of weather is pretty overwhelming for those of us uninitiated. 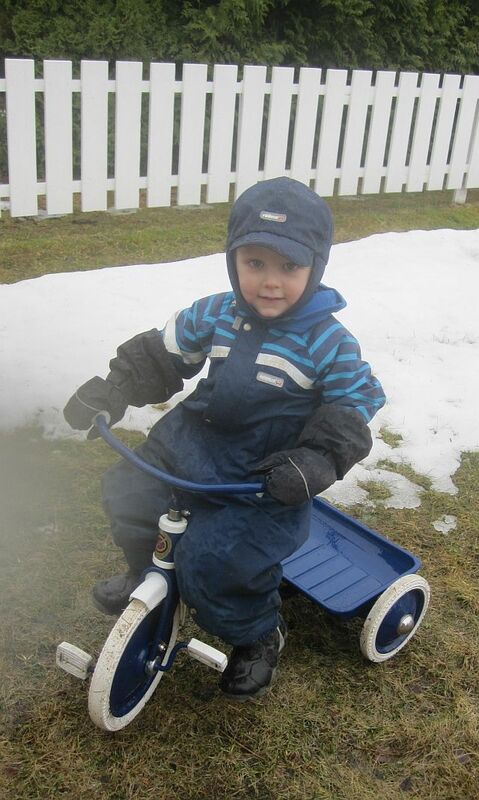 Rain suits, snow suits, rain boots, snow boots, rain mittens, snow mittens — which is which? What do you put on when it’s snowing when you leave in the morning but will surely be raining in the afternoon? Your guess is as good as mine. It’s always kind of embarassing when people see my incompetence with the norwegian-winter-clothing thing and assume that maybe I’ve never lived where there was snow before. ”No,” I confess out loud, ”spent a pretty big chunk of life in the midwest… in the snow.” ‘We just put on layers of cotton and got cold and wet which was all part of the experience’ is what I say in my head. 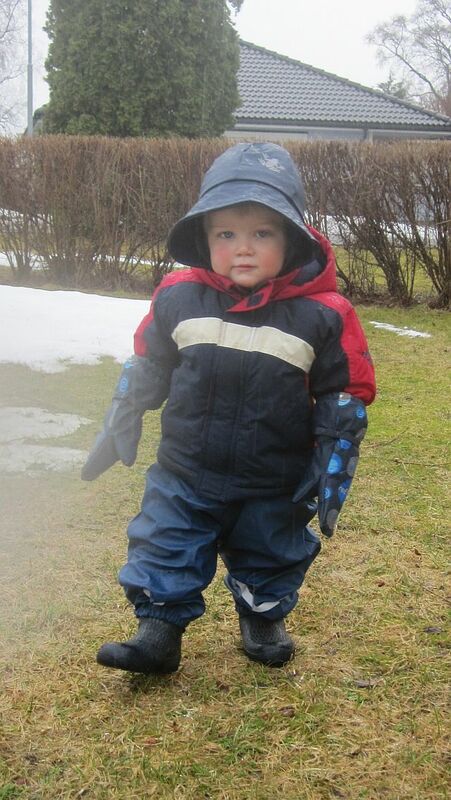 But — Norwegians have, in my humble opinion, perfected the art of outdoor clothing. If you took a random survey here in Nord-Trøndelag asking people in the street the last time they were cold or wet while working or playing outside, I bet 9 out of 10 will say ”Never.” Wrapped in wool since they day they were born, these trønders. Just like Emil has been. Anyway — a couple of pictures of the boys as we walked to barnehage this morning, decked out in the rain gear which I am so grateful to have. I really is lovely to be able to go out regardless of weather conditions and be warm and dry. So thank you, Norway, for proving that (maddening) expression to be (mostly) true.